From a childs mind, our greatest hopes for the future emerge. The Kyle O'Connell Foundation was established in memory of Kyle Alexander O'Connell who, on February 6, 2005, at the tender age of 9, succumbed to brain stem glioma, a pediatric brain cancer. Kyle's life was too brief, but very inspirational to everyone who knew him. His legacy is one of strength, courage and hope. 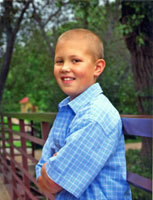 To understand the goals and purposes of the Foundation, one must know about Kyle's 2-year journey with cancer. Kyle's strength was not just in enduring the surgeries, radiation and chemotherapy, but also in the wonderful humor he maintained. Despite slowly losing use of his left side, the weight gain attributed to steroids, losing his hair and the brace he wore on his left leg, Kyle gained new confidence to look beyond these obstacles. Nothing was more important to Kyle than his family, his friends and having fun. The efforts of the Foundation will be to create awareness and raise funds to support pediatric brain tumor research, as well as assisting families impacted by the many struggles associated with pediatric brain tumors. Read here for more information about the progress that has been made with your generous donations. May is Brain Tumor Awareness Month and the Kyle O'Connell Foundation is teaming up with Mount Carbon Elementary to support families affected by brain cancer. On May 16th, the entire student body will log miles to show their support with Miles for Miners- Bucks for Brains. Our goal is to run over 800 miles! Students have the opportunity to collect pledges for the Kyle O'Connell Foundation and earn prizes for their participation. Donate now during the month of May and help us support local families who have a child being treated for brain cancer.